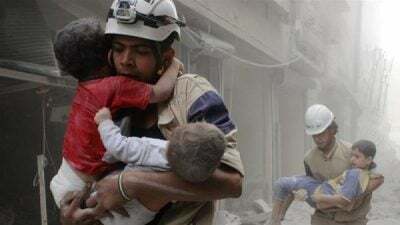 It is overall a very ., so much so that it has won numerous awards including the Oscar for Best Documentary Short this year and the White Helmets themselves were nominated for the Nobel Peace Prize. More to the point, however, is the undeniable fact that the documentary has helped shape the public understanding of what is going on in Syria, delivering a Manichean tale that depicts the “rebels” as always good and Bashar al-Assad and his government as un-redeemably evil. So by all means let’s organize to revoke the White Helmets’ Oscar due to misrepresentation and fraud. It might even serve as a wake-up call to George Clooney and his fellow Hollywood snowflakes. But the bigger take-away from the tale of the White Helmets would appear to be how it is an unfortunate repeat of the bumbling by a gullible U.S. government that has wrecked the Middle East while making Americans poorer and less safe. A group of “moderates,” in this case their propagandists, is supported with weapons and money to overthrow a government with which Washington has no real quarrel but it turns out the moderates are really extremists. If they succeed in changing regime in Damascus, that is when the real nightmare will begin for minorities within Syria and for the entire region, including both Israel and Saudi Arabia, both of which seem intent on bringing Bashar al-Assad down. And the truly unfortunate fact is that the Israelis and Saudis apparently have convinced an ignorant Donald Trump that that is the way to go so the situation in Syria will only get worse and, unless there is a course correction, Washington will again richly deserve most of the blame.